Tuesday, November 27, 7:30 a.m.
As the sun rises, I awake from a fitful seated sleep in a giant metal tube hurtling through the sky at about 600 miles per hour. Below me, the Arabian Peninsula and Persian Gulf meet at a margin so crisp that it looks fake, like the line you’d see on a printed map rather than in real life. I remind myself, we’re at about 38,000 feet altitude and so planet Earth is actually abstract from up here. Somewhere below, it’s Tuesday morning in Oman’s capital city of Muscat, and I left the United States at Sunday midday to begin my journey here. At once, that feels like a long time and a little time. The time-travel aspect of airplane transport always befuddles me. 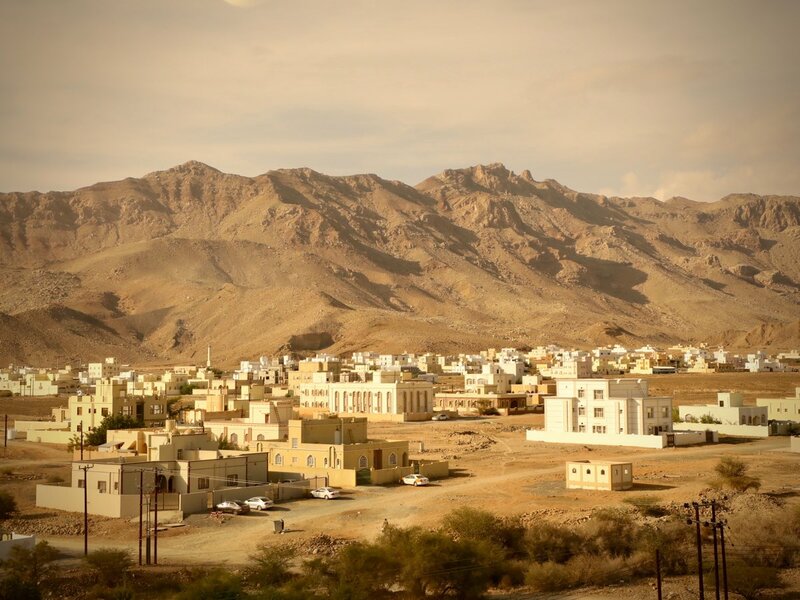 I am enroute to the inaugural Oman by UTMB, what’s billed as a 137-kilometer (85-mile) race with 7,800 meters (25,600 feet) of climb that travels point-to-point over a great chunk of the Jebel Akhdar, which means Green Mountain. 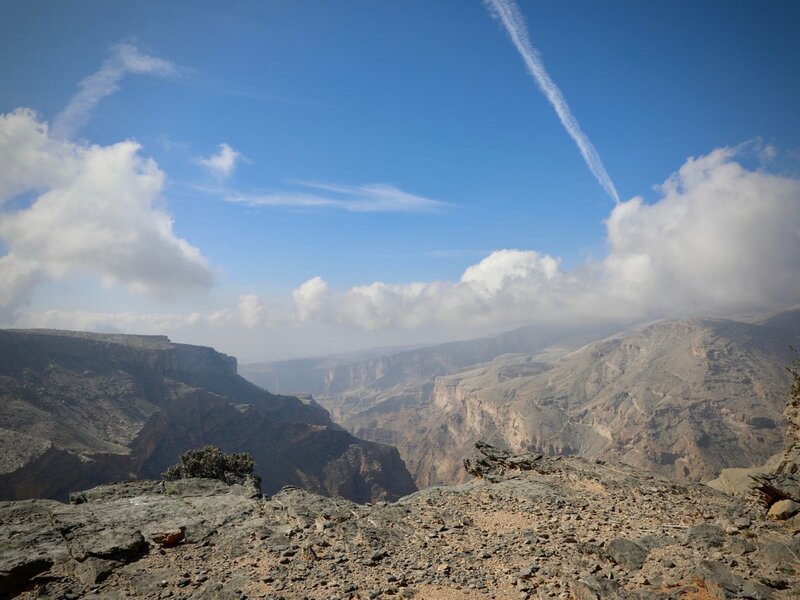 In reality, Jebel Akhdar is a swath of mountains that are part of a greater range called the Al Hajar Mountains stretching largely east-west for several hundred miles in north-central Oman. The race itself is a UTMB franchise, operating under the UTMB International umbrella but owned and enacted by the Omani tourism government entity, Oman Sail, which started to promote sailing tourism but has, clearly, diversified. I heard about this event from UTMB co-founder Michel Poletti when it was in its planning infancy. As few years back, we ran into each other on the sidelines of race somewhere in the world, when he was just back from an Oman by UTMB course-scouting trip. He asked me if I’ve ever heard of a mountain range reaching almost 3,000 meters in altitude on the Arabian Peninsula. Michel is an avid ultramarathoner keen on the sport’s adventure and experiential aspects, and his bemusement piqued my interest. I closely followed the race’s development over time and pulled the trigger on running it after the first edition was announced. 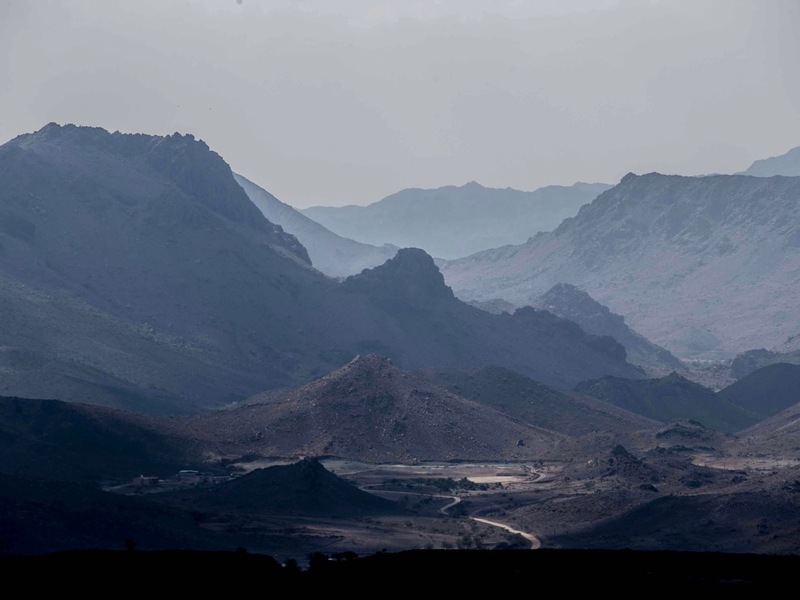 The mountains and valleys of Oman. Photo by Franck Oddoux, courtesy of Oman by UTMB. Not an hour after my airplane lands, I’ve joined an all-day tour to take in the city and its environs. It’s my first time in Oman and I’m here for just six days. Even if the race starts in only two days, I’ll pack my time fully. 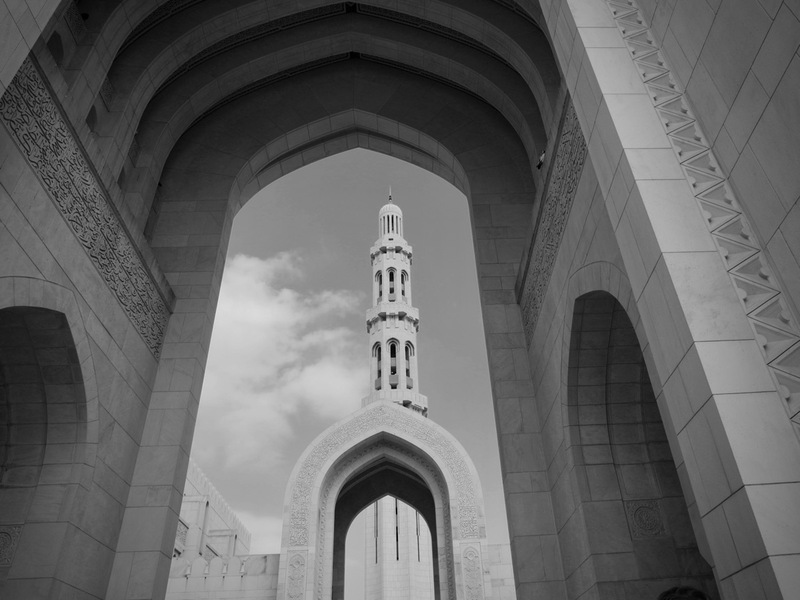 Our first stop is at the Sultan Qaboos Grand Mosque. The Grand Mosque is a massive contemporary structure, completed in 2001 and named after Qaboos bin Said Al Said, the Sultan of Oman. A sultan is essentially a king or a country leader, and Sultan Qaboos has reigned since 1970. Much of the structure is composed of white marble. As our group walks the grounds and approaches the mosque, the low-latitude sun reflects off its marble, making it feel like we’re walking into an oven rather than a house of worship. The marble-filled courtyard through which we roam, our guide tells us, is meant to hold 20,000 people. Even with sunglasses, I squint my eyes in the bright, white light in order to see it. While much of the mosque’s interior is also made of marble, tiles composed of other rocks have been arranged into ornate, colorful mosaics that span dozens of feet. Too, there are giant stained-glass windows which we are told were made in France–Sultan Qaboos sourced all of the mosque’s materials from the global experts of said materials. The mosque has two major prayer rooms, a women’s room with a 750-lady capacity, and a men’s prayer room reportedly made to hold 6,000 men. How can you call it a room at this size, though? It’s a big as a convention center. Both rooms are, in a word, magnificent. Giant crystal-and-gold-plated chandeliers brighten both rooms, and each has a custom carpet. Our guide tells us that the carpet in the men’s prayer room is 4,200 square meters and was made by 600 women in Iran. Muslims pray five times per day: before sunrise, just after midday, late afternoon, around sunset, and later in the night. These daily prayers are called salah. While Muslims can and do pray almost anywhere, many more men than women go to mosques to do so, hence the huge size difference in the women’s and men’s prayer rooms in the Grand Mosque. The call to prayer is called the adhan, and it precedes each prayer time. These calls to prayer are recited live or a played on a recording through speakers at the top of the minarets in every mosque. These adhans are composed of generally the same words, with slight variations, and the muezzin, the man who makes these calls, puts his special touch on them. The effect of this is that, the world over, practitioners of Islam universally unite in daily prayer. Many areas of the Grand Mosque and its grounds are open to all visitors each morning except Friday, which is the religion’s weekly holy day. We women don scarves and cover our ankles with pants or a long skirt, and we remove our shoes to explore the rooms. It is a privilege to explore the Grand Mosque, to learn about the structure’s details and the religion that is practiced here. And it’ll be another privilege to imagine the daily, global gatherings symbolized by the adhans that I’ll hear everywhere, five times a day for the next six days. 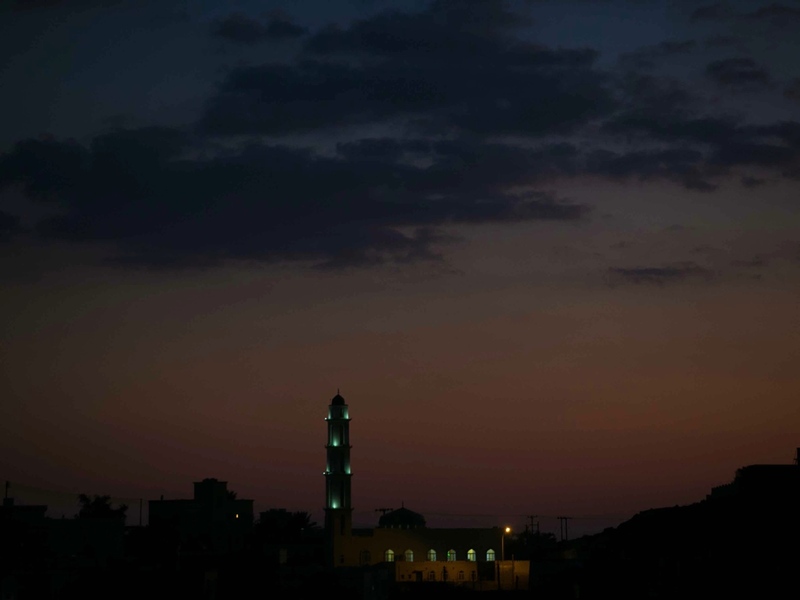 A mosque’s minaret lit up at night. Photo by Franck Oddoux, courtesy of Oman by UTMB. Wednesday, November 28, 9 a.m. The first night’s sleep after international travel is my favorite kind of sleep. It’s the same amazing sleep you have after running a 50k or 50-mile race–you’ve tuckered yourself out enough that nothing can disturb you. After laying like an unmoving rock for nine hours, I wake feeling like my brain is back inside my skull again. The legs are still puffy from the two long-haul flights involved in getting here from America, and they feel like they aren’t actually attached to my body when I take to the streets for a morning shakeout. 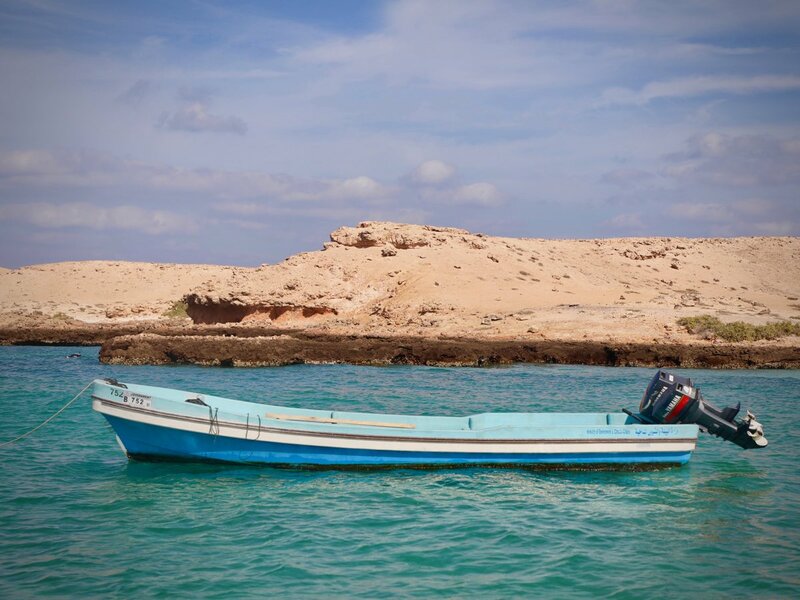 A small group of runners assembled from all over the world to take part in tomorrow night’s Oman by UTMB are spending the day snorkeling on the Ad Dimaniyat Islands, which are located 11 miles out in the Gulf of Oman from the coastal city of Muscat. The event is organized by Oman Sail, and it’s one of several I’ve been invited to take part in this week. The 90-minute ocean crossing to the islands is made by powerboat. 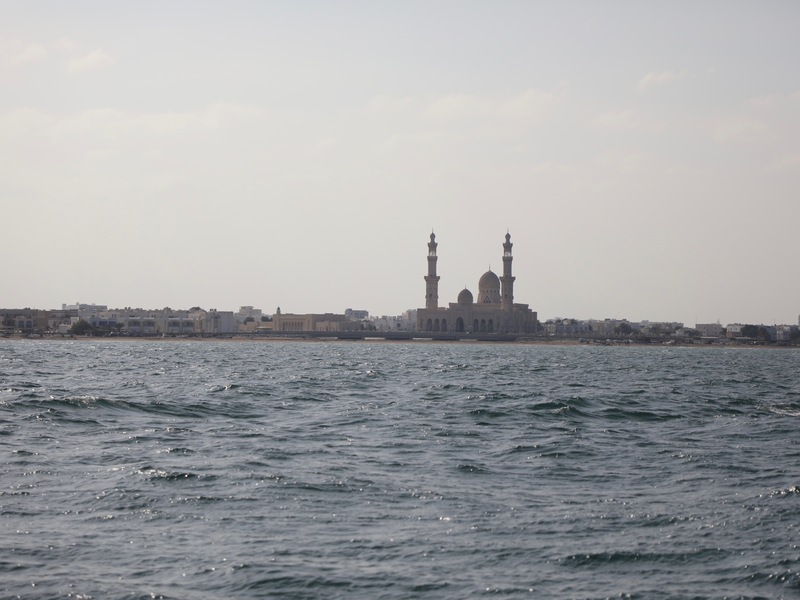 The Gulf of Oman is choppy today, so for most of this trip we are cutting through six-foot swells. The boat’s nose pointed into the great blue, we leave the coastline behind. Finally, when we are less than a mile away, the islands’ light-colored land reveals itself between the swells. There are several islands and each is tiny. They are composed of white and dark-orange limestone that is sharp to the touch and ringed in places with fine, white-sand beaches. In a cove that’s protected from the open ocean, the boat backs into the narrow beach of one of the islands to unload all of us. Many of us have come from winter in our respective homes and are eager to let the warm sun soak into our skin and to dive into the warm water. Over the next couple hours, we lounge on the beach, comb the island’s nooks and crannies, and snorkel around the cove. When we put our faces into the salty water, a magical marine world reveals itself to us. Sea stars, sea cucumbers, more than a dozen kinds of coral, fishes of all shapes and colors, sea urchins, a couple squid, and even a few green sea turtles populate this cove. Though everything is beautiful and interesting to examine, the sea turtles steal the show. The little one is shy and disappears quickly into the ocean’s murky deeps. The other, larger and wearing a shell covered with a carpet of green algae belying its extended time on planet earth, doesn’t seem mind as six or eight of us watch it feed on the coral. After snorkeling, we all clamber around a buffet lunch on the beach. Several kinds of fresh-squeezed juices, multiple salads, baby quiches, hamburgers and fries, fish, curry, chicken, vegetables, biriyani, mousse, and much more await us. Here on the light-colored sand, the sun is hot. I slathered on sunscreen before the boat ride, but suddenly it doesn’t feel like enough. I borrow a big dollop from another runner and smooth it on, put back on the hat I wore over here, and hide my feet in the sand. How painful it will be if I burn the tops of my feet before running 137k tomorrow night! The boat ride back to shore is faster and smoother. While the swells remain, we’re traveling with the wind and waves, easing over them instead of breaking through. Traveling fast, it’s too loud to talk with my fellow runners, so this offers an hour of introspection as we watch the Muscat coastline come into view beyond the sparkly seawater. Last week I celebrated American Thanksgiving with friends, today I’m watching sea turtles make a life in the Arabian Sea, and tomorrow I’ll experience part of a mountain range on the Arabian Peninsula by foot, I think. Places, people, and experiences, there are so many ways we can connect with this world. Thursday, November 29, 5:45 p.m.
Late afternoon arrives to the small town of Nizwa, located about two hours south and inland from Muscat, and near the southeast base of the Jebel Akhdar. Oman by UTMB starts in under two hours and my shuttle to the starting line leaves in 45 minutes, so I am making the final preparations to my pack. No one’s run this race before, so it’s hard to know what to expect. But with the variables of distance, vertical relief, technicality, and heat, I’ve planned to be out for 30 hours. I have no crew and we are allotted just one drop bag at about 50 miles into the race, so my pack is heavy with 50 miles of food. The heat of the day has waned, and I open my hotel room’s windows to let in the evening air. The sunlight is yellow, long, and soft. Locals say this hazy air is a combination of humidity and suspended sand carried by the wind from the desert, which opens not far to the south. The sounds, smells, and feel of Nizwa envelope me, making me feel calm and happy. 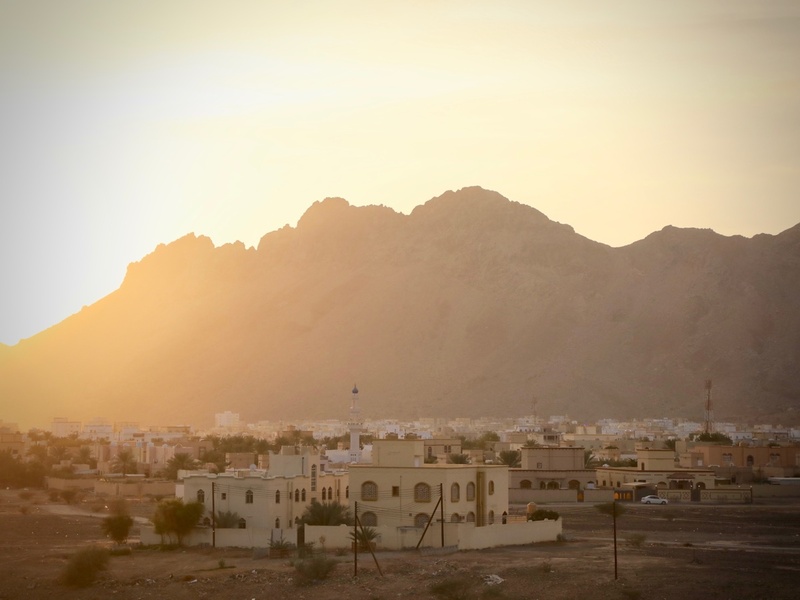 The Oman by UTMB starting line is in Birkat Al Mouz, a fort and village located literally at the foot of Jebel Akhdar. 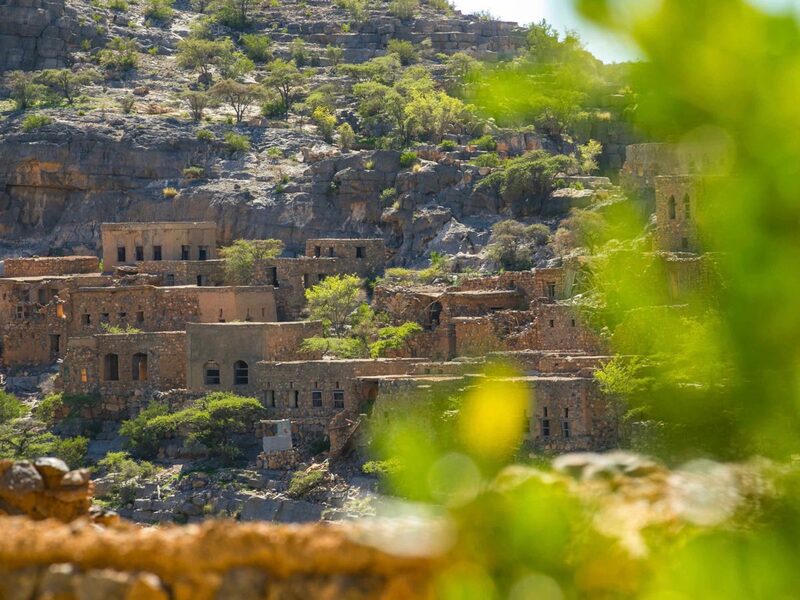 We are told that the Bani Riyam tribe built this fort and others like it several hundred years ago to safeguard its home range up on the Jebel Akhdar. It is dark, and the race organization casts green light on the historic fort’s walls. Local entertainers play instruments, dance, and sing, building more atmosphere into the last few minutes before the start. At last, we 326 starters are released into the night, the pressure valve opened on our collective, potential energy. Without really trying, we sprint through Birkat Al Mouz’s streets on a kilometer-long glory lap while locals watch curiously. Soon we leave the street lights behind, flick on our headlamps, and thread through the village’s agricultural sprawl. 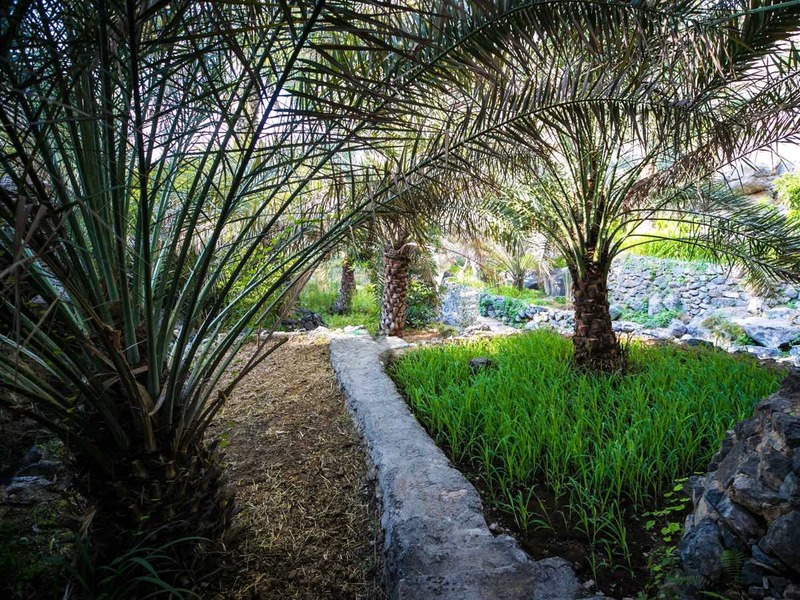 Birkat Al Mouz means Pool of the Plantains, a name referencing all the food that’s grown here. Next we enter a huge dry wash, or wadi, this one called Wadi Al Muaydin. 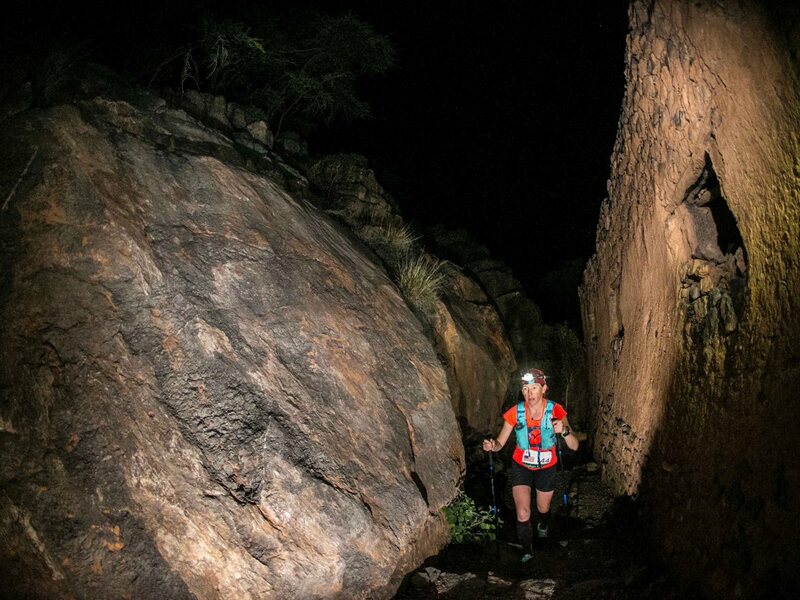 Up the wadi and into the night we run. 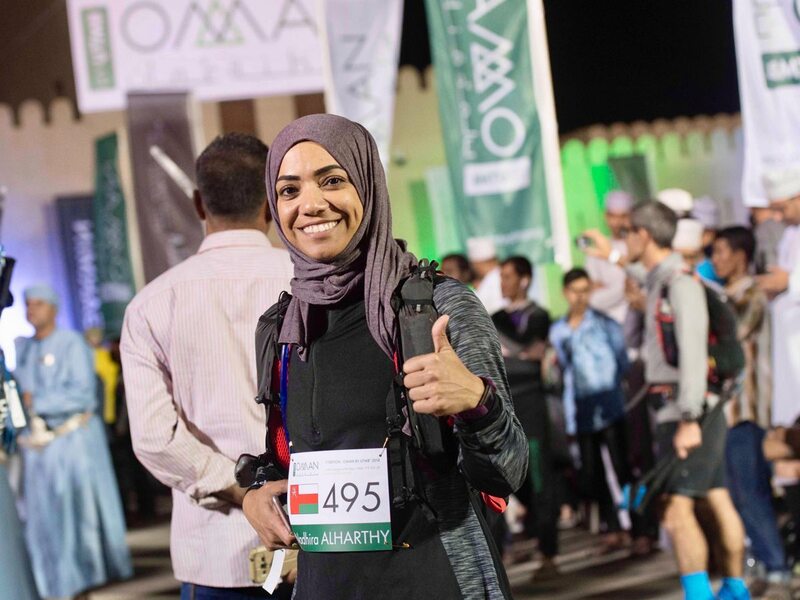 Oman’s Nadhira Al Harthy made it 88 kilometers of the way through Oman by UTMB before retiring. Photo by Mark Lloyd, courtesy of Oman by UTMB. Friday, November 30, 4:30 a.m. I am now about 35 miles and nine hours into this adventure. It’s a few hours until sunrise still and black as pitch. I can’t see a thing but I can feel that I’m jogging along the edge of cliff that opens into a vast expanse. My headlamp, as bright as it is, is simply swallowed up by the dark before its light lands on anything below. The course is marked exquisitely by green paint and reflective green circles, the latter of which are glued onto the rocks. The markings are so prolific that I feel certain of where to go at all times. This is good because in many places there is no trail tread, no ribbon of singletrack to follow. Platforms of just rock extend for a mile or two at a time, and the only way to know where the route goes across them is with the route markings. The course is also marked with reflective red markers. We were told at the pre-race briefing that the red markers delineate cliff edges and other dangers. In a typical mountain ultramarathon, you’d occasionally pass through exposed places, so I had expected to see these red markers once in a while. I expected wrong. They are so frequent that it’s actually humorous. Until the sun comes up and I can see it all with my own eyes, the red markers seem to indicate our passage through dozens of exposed places so far. The author in an old stone village in Wadi Beni Habib on the first night of Oman by UTMB. Photo by Franck Oddoux, courtesy of Oman by UTMB. I trace my way along the cliff edge, keeping the red markers at a safe distance. The wind puffs hard and chilly from down to up, up the cliff, up into my face. Tendrils of fog–or clouds, I don’t know–whip up on the wind, curl over top the cliff, and melt away. We runners are now stretched out along the course, and both behind and in front of me I see other runners’ lights bobbing through the night. Above, the sky is dark, with no hint of sunrise yet. The stars, when not momentarily masked by the fog-clouds, twinkle brightly. There is nothing about this moment that’s comfortable, right? I’ve already come a long way in this race but there are ages of time yet to go. I’m alone on a random rock plateau on the Arabian Peninsula and everything I know anything about is literally thousands of miles away. I’m traveling along a hulking void with a size and shape I can’t even begin to imagine. But somehow, none of this feels scary, or empty, or lonely, or even uncomfortable. My heart and soul and feet feel tangled together with the air and sky and earth and the lights of my fellow runners and the stars above me. I feel familiarity in the foreign-ness. I don’t have any answers or explanations–look, there’s not really any headspace left for philosophical transcendence while keeping tabs on all those red dots­–so I simply absorb and live this moment as it is. Oman at night. 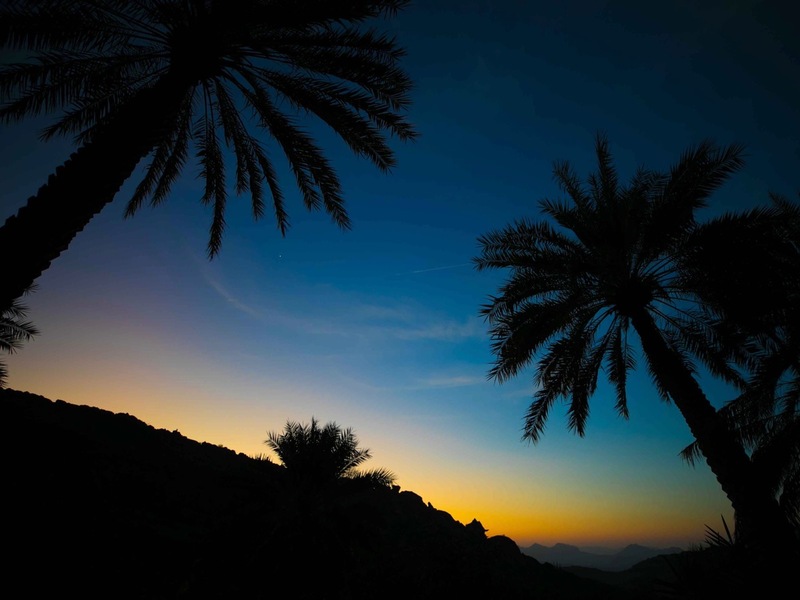 Photo by Franck Oddoux, courtesy of Oman by UTMB. It is only mid-morning and already the heat has arrived. I’m at the bottom of a giant canyon, on what’s called the Lost Villages Trail. In fact, I’ve just passed through one such lost village perched on the steep hillside just above the canyon bottom. The buildings are crumbling, returning to the earth from which they were originally built. The same is true for many of the small, former villages through which we’ve traveled up here on Jebel Akhdar. But signs of modern farming are everywhere in this canyon bottom, as is water. Someone must come here on foot from quite a distance and over significant vertical relief to tend the small crop fields. In the desert, wherever there is water, there is life. A village on the Jebel Akhdar. Photo by Franck Oddoux, courtesy of Oman by UTMB. I’ve sucked down my two softflasks of water in only the last couple kilometers, over the rough and south-facing terrain and under a broiling sun. We pass pools of clear water held in the smooth curves of exposed rock along the canyon bottom. I dip my softflask, which is topped by a Katadyn BeFree filter, and drink. A momentary, personal oasis. 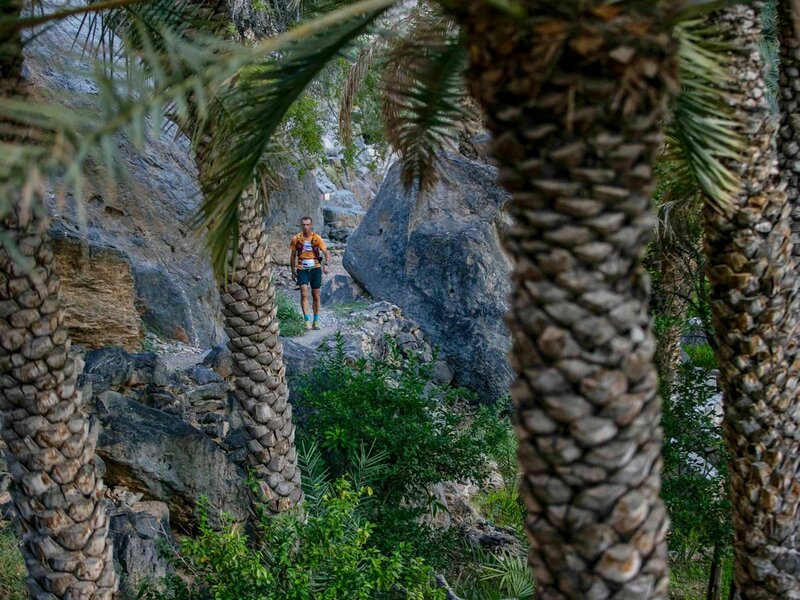 An Oman by UTMB participant traveling in a canyon. 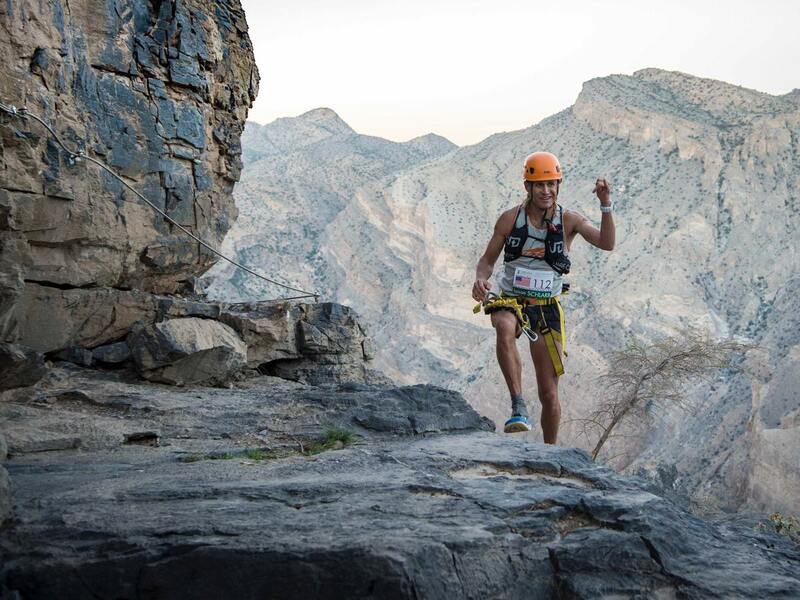 Photo by Franck Oddoux, courtesy of Oman by UTMB. A long climb awaits, with the top part perhaps the course’s most anticipated bit, a via ferrata. Before that, I’ve got to scramble up these dry falls, smooth rock which would run with water in a storm. This is the kind of movement I do in my adventures at home so I feel comfortable, but I’m surprised to find this sort of terrain on a long ultramarathon course–third-class scrambling moves here and there. Above these dry falls is a steep trail leading into the sky–and the waiting via ferrata. Under the supervision of a climbing guide at the bottom of the via ferrata, I don a helmet, harness, and a pair of energy-absorbent lanyards with carabiners at their ends. When the guide sees I am sorted, he sends me off. Via ferratas are typically long metal cables bolted onto cliffs and other exposed areas over which you scramble and climb. You clip into the cables with your lanyards, and this provides protection should you fall. Sometimes, hand and foot holds have been additionally carved out of or installed on the rock, the latter just like you’d see in a climbing gym. I have so much fun skittering along ledges and lizarding up vertical passages. The USA’s Jason Schlarb finishing up the via ferrata. Photo by Mark Lloyd, courtesy of Oman by UTMB. Another climbing guide awaits at the top to collect my gear, and from there it’s a short jog to the Alila Hotel, the site of one of the race’s main aid stations and where our drop bags are staged. I head in, with a mental map of how I’ll spend about 10 minutes reloading my pack with another 14 hours of food from my drop bag, filling my belly with the aid station’s fresh fruit which looks delicious, sitting in the shade to cool off, and lathering myself with sunscreen. I make it in and out in 10 minutes, but when I’m a kilometer past the aid station and feeling the hot sun on my neck again, I realize that I forgot to put on the sunscreen from my drop bag. My thoughts come a little bit slow, what, more than 14 hours into the race, but soon enough I remember that I’ve got a tiny tube hidden in the bottom of my pack along with the other mandatory kit–such as my emergency blanket and back-up flashlight–I am required to carry but didn’t think I’d actually use. I yard sale my pack onto the singletrack to find it, squeeze the entire tube into one hand, and carefully dole it out onto various exposed body parts: my face, neck, ears, arms, and legs. The cream is cool and soothing. It’s the simple things at halfway through a long ultramarathon. As I faff around with all this, Oman’s Hamdan Al Khatri, wearing a bright green shirt, motors past. All through the last canyon and climb, I entertained myself by watching he and his shirt weaving through the terrain ahead of me. And then, in the aid station, he was also there, taking his time with a plate of biriyani. I cannot know it just yet, but Hamdan will come to feature prominently in the second half of my race. Friday, November 30, 6 p.m. The second night of Oman by UTMB approaches. I am at mile 73 and in the middle of the race’s biggest climb. I’ve already climbed 1,000 vertical feet of it and have 3,000 to go in the next 2.2 miles. I know what’s ahead, and I’m eager. I love stupid-steep terrain. Right before the bulk of the climb is an aid station at the edge of the village of Balad Sayt, where locals ready themselves for night, coming off the steeps with their goats and buttoning up the windows and doors of their homes. I’m not generally one for sitting in aid stations–I think chairs are time traps–but I give myself two minutes to fuel up for the big-momma climb. I sip Coke and gorge myself on orange slices and banana chunks, laughing about the fact that this is tonight’s dinner. An example of the small agricultural fields near water sources on the Jebel Akhdar. Photo by Franck Oddoux, courtesy of Oman by UTMB. Hamdan and I have continued to leapfrog. He’s generally been faster than me on the flat sections, and me faster than him when the route pitches up or down. We’ve developed a friendly tradition of encouraging each other and saying something like “See you in a little bit!” when we pass each other. Now, anytime I catch sight of his green shirt, a warm feeling comes about. He motored into Balad Sayt just ahead of me and stayed for less time, so he has started the climb first. A couple hundred feet up, I turn on my headlamp, and a few minutes later Hamdan does the same a bit above. This section is exposed in a lot of places, with cement steps built onto the cliffs and cracks to shimmy up. The red markers are as plentiful as the green. So many miles into this race and through so many no-fall zones, I travel steadily, intentionally. Hamdan and I periodically check on each other, flashing our lights in each other’s direction. Soon, I catch Hamdan as he takes a short breather, saying he feels a little weak and dizzy. He’s not ill and says he feels hungry, though, so I encourage him to take a bite of his food. Now we travel together, me in front as I listen to him crackle the package of his snack. It’s a long way but eventually we arrive to the next checkpoint at the top of the cliff. From here, it’s a couple miles along another lofty ridgeline. This ridge is heavily dissected, requiring us to scramble down, through, and back out of the breaks. The course profile made this section look relatively flat, but its scale was too small to identify these small but time-consuming bits. The hard work continues, requiring our full concentration. Eventually, we meet the final climb to the ridge’s–and race’s–highpoint. Hamdan and I have accordioned a bit up here, me dropping back first to put on some warm clothes and him later for something else. I reach the top alone, Hamdan’s light glowing a little below. I feel a sense of relief, as it’s supposed to be just nine miles and 5,500 feet of descent to the finish line now. I can start to smell the barn. Saturday, December 1, 12:10 a.m.
All that relief I felt at the top of the final climb is gone, long gone. I should have known, this course, while it has had its moments and miles of ease, packs difficult punch after punch. While I’ve tolerated most of the punches well enough, the final downhill finally breaks me. It’s made up of mostly rock. There are rock platforms you run for a mile, skittery scrambles, and giant boulders in wadi bottoms. Every kind of rock you can imagine is here, and it’s all battering the soft flesh on the bottom of my feet to a pulp. It seems that maybe I trained too many miles on the soft snow of early winter back at home and too few miles on rocks. Each footfall now feels like a hammer blow. The leapfrogging with Hamdan continues. He catches up, moves ahead, and then I catch him. At some point, we fall into intentional step with each other again, and decide to stay together to the finish. The reported length of the race comes and goes on my watch and we’ve not yet hit the last aid station, which is supposed to mark five kilometers to go. My feet are killing me and Hamdan looks exhausted, too, his feet barely clearing the rocks over which we run. We exchange stories about what we have thought of the race course, how we are feeling, our lives at home, our running history, and even our religious inclinations (or lack thereof). Our conversation is punctuated occasionally with grunts and groans of pain and then laughter over our predicament. Somehow, some way, we are actually, truly having fun. You can see and hear the finish line, located in a brightly lit field at the edge of the small town of Al Hamra, about 1.5 miles before you arrive to it. We laugh over how something can seem both so far and so near, me flashing back to the same feeling I had a few days ago during my travels to Oman. Oman’s Hamdan Al Khatri and the author at the Oman by UTMB finish line. Photo courtesy of Hamdan Al Khatri. When we finally, ultimately come off the rocky trail, a small group of Hamdan’s friends are there to cheer for him. He’s about to become the first Omani finisher, and the hope of his country is carried on his legs. Invigorated, Hamdan takes off at nine minute-mile pace, which feels impossible to my battered feet, and he almost drops me. But we’ve been running near each other and working in tandem for something like 14 hours, so when Hamdan realizes I am falling back, he slows to let me catch up. Then I push through that nine minute-mile pace, carried in part by the energy of he and his friends. Together we cross the finish line, he the 15th man and me the fifth woman. 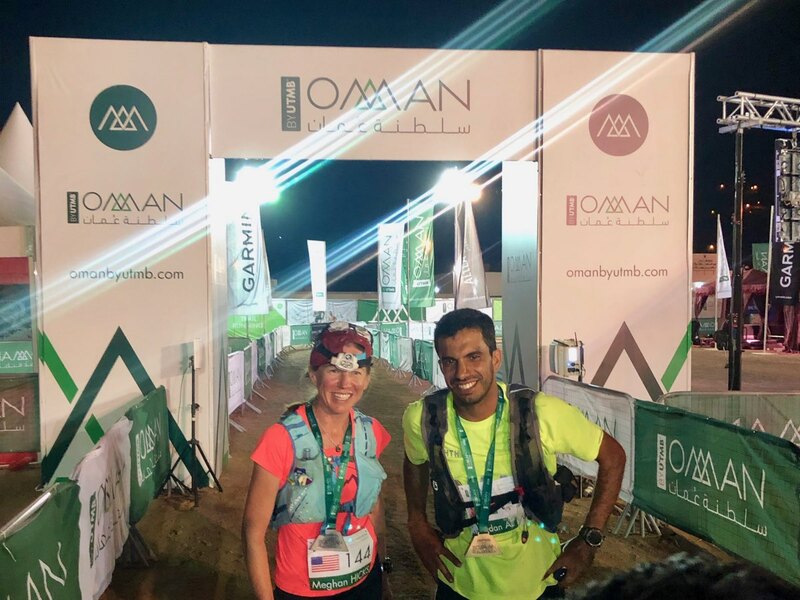 We become two of the 142 total finishers of the inaugural Oman by UTMB. Even during the times when we were running separately, Hamdan and I’s experience became shared. I have made it here in part because of him, and he a little bit because of me. Really, it’s a bit of the same for all of us finishers. This reminds me a little of the Muslim calls to prayer and of what I felt whilst alone but not lonely in the cloud tendrils on the cliffside last night: humanity’s unification is not contingent on proximity. Whether we notice or comprehend it, we share a universal connection. Loved this, great read ! and a Great run Meghan ! Phenomenal writing, and thanks for sharing… you have a real way of bringing us readers along for the adventure! Congrats on a super run Meghan! Love hearing the details of your race. Great report M! Oh, I loved this piece. Thanks as always for writing.